AI with intelligence equal to or beyond human beings is often referred to as "strong AI" or Artificial General Intelligence (AGI). Experts disagree as to when such an intelligence will arrive into the world, but many are betting it will happen sometime in the next two decades. The idea of a thinking machine being able to rival our own intellect—in fact, one that could quickly become far smarter than us—is both a reason for serious concern and a reason to cheer about what scientific advances it might teach us. Those worries and benefits have not escaped religious. "I don't see Christ's redemption limited to human beings," Reverend Dr. Christopher J. Benek told me in a recent interview. Benek is an Associate Pastor of Providence Presbyterian Church in Florida and holds masters degrees in divinity and theology from Princeton University. "It's redemption to all of creation, even AI," he said. "If AI is autonomous, then we have should encourage it to participate in Christ's redemptive purposes in the world." One of the key mandates of Christianity is to spread the Gospel and get nonbelievers to accept that Jesus Christ died for the world's sins. Whether AI has any sins, or whether it can and should be saved at all may end up being a bizarre but important question believers face in the 21st century. Even Pope Francis recently sounded off on the possibility of aliens being converted when he affirmed that the Holy Spirit blows where it will. The metaphysical questions surrounding faith and AI are like tumbling down Alice's rabbit hole. Does AI have a soul? Can it be saved? There is one school of thought that figures, if humans can be forgiven for our sins, why not superintelligences with human qualities? "The real question is whether humans are able to be saved—if so, then there is no reason why thinking and feeling AIs shouldn't be able to be saved. Once human-like AI exist, they will be persons just like us," futurist Giulio Prisco, founder of the transhumanist Turing Church, told me in an email. But there is an opposing school of thought that insists that AI is a machine and therefore doesn't have a soul. In Think Christian, scientist and Christian scribe Dr. Jason E. Summers writes, "Christians often reject Strong AI on the theological ground of the special anthropological status of human beings as the bearers of Imago Dei." Imago Dei is Latin for the Christian concept that humans were created in the image of God. The world's major Abrahamic religions—Judaism, Christianity, and Islam—all believe in the soul, which is what many major religious texts say is the thing that separates us from other life on the Earth, including other mammals. Because the Abrahamic religions comprise the faiths of roughly two-thirds the world's population, the question of "soul" is quintessential in the coming transhumanist age of machine intelligence. Getting even deeper into this theoretical debate is the question of whether strong AI would even accept our religion. "It's only fair to let AI have access to the teachings of all the world's religions. Then they can choose what they want to believe," said Prisco. "But I think it's highly unlikely that superhuman AI would choose to believe in the petty, provincial aspects of traditional religions. At the same time, I think they would be interested in enlightened spirituality and religious cosmology, or eschatology, and develop their own versions." 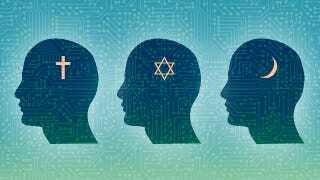 Once you start thinking like that, it opens up even more questions: How would AI fit into to the religious tension already present around the world? Who is to say a machine with human intelligence wouldn't choose to become a fundamentalist Muslim, or a Jehova Witness, or a born-again Christian who prefers to speak in tongues instead of a form of communication we understand? If it decides to literally follow any of the sacred religions texts verbatim, as some humans attempt to do, then it could add to already existing religious tensions in the world. Christian theologian James MaGrath, the Clarence L. Goodwin Chair in New Testament Language and Literature at Butler University, writes about androids who posses super intelligence in an essay titled Robots, Rights, and Religion: "In all likelihood, if androids were inclined to be extremely liberal, they would quickly discover the selectivity of fundamentalism's self-proclaimed liberalism and reject it, although the possibility that they might then go on to seek to enforce all the Biblical legislation in every details should indeed worry us." The idea of teaching anything to an intelligence that could rather quickly be far smarter than humans is contradictory. Another possibility is that AI will teach us new things about spirituality that we never considered or understood. It may tell us how the cosmos were created, or whether we exist in some simulation theory, or even that there are many AIs before it—ones that are much more sophisticated than itself. Whatever happens, the creation of AI will likely spawn a paradigm shift for human civilization. Rather than converting it, we might just want to stand back and listen. Benek agrees with this, but through his own metaphysical lenses. He says, "The Holy Spirit can work though AI; it can work through anything. There may be churches set up to deal and promote religious AI in the future. AI can help spread the word of God. In fact, AI might help us understand God better." If Benek is right, America might be a nation filled with robot pastors and AI spiritual gurus in the future. Decades or centuries from now, spirituality may be taught to us through machines, just like science will likely be. Prisco takes it a step further: "How smart must machines be to understand the so-called mind of God? 5,000 times smarter than humans? A million times smarter? I don't know, but in a hundred years a machine intelligence may have a far better chance of finding that out than the human brain with its limited capacity." The Turing Church started as a working group at the intersection of science and religion, and recently became an online, open-source church built around Cosmist principles of space expansion, unlimited growth, and universal love. Cosmism "doesn't care if you're viewing the universe as information or quantum information or hypercomputation or God stuff or whatever," writes cyberculture personality R.U. Sirius in his recent book Transcendence. "Nor does it ask anyone to commit to AGI [artificial general intelligence] or mind uploading or brain-computer interfaces or fusion-powered toasters as the best way forward. Rather, it seeks to infuse the human universe with an attitude of joy, growth, choice, and open-mindedness. Cosmism believes that science in its current form, just like religion and philosophy in their current forms, may turn out to be overly limited for the task of understanding life, mind, society, and reality." Despite the seemingly scifi nature of it, uploading the human mind into an AI being could arguably solve the 'soul' question. Experts like Google engineer Ray Kurzweil are actively researching ways to upload the brain into computers, and last year there was significant progress in the field via brainwave headsets and telepathy. Renowned technology entrepreneur and author of Virtually Human:The Promise - and the Peril - of Digital Immortality Martine Rothblatt theorizes that anything that values life or God, or even has the potential to value life or God, has some kind of soul. A whole chapter of the book explores religion in the time of AI, uploads, and mindclones—software versions of human minds. Rothblatt thinks mindclones are in line with classical interpretations of religion and will be welcomed that way in the future. Rothblatt founded Terasem, a scientific "transreligion" similar to the Turing Church in scope and approach, which runs preliminary mindcloning pilot projects. The most famous one is Bina 48, a robotic head that contains a mindclone of Rothblatt's still-living wife Bina. And perhaps that's the only way AI should be launched—with people uploaded into it. What fascinates me most about this is the question of who might be the first person uploaded. Do we send a scientist? A programmer? Or a religious person? All at once? If this is starting to sound like the movie Contact, where a U.S. Presidential commissioned advisory board decides to send a believer—and not the more qualified atheist—to meet some type of alien intelligence for the first time, you're exactly right. It's like an international team of experts on a mission to find its way to the outer reaches of machine intelligence. That way whatever happens, at the very least, we know humanity is aptly represented. Including spiritually.